Another Sesshomaru (with short hair again)!! Just can't. It looks too beautiful. 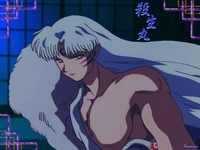 Sesshomaru is masculine yet beautiful. Brilliant depiction of him. Always love his short haired version from you.